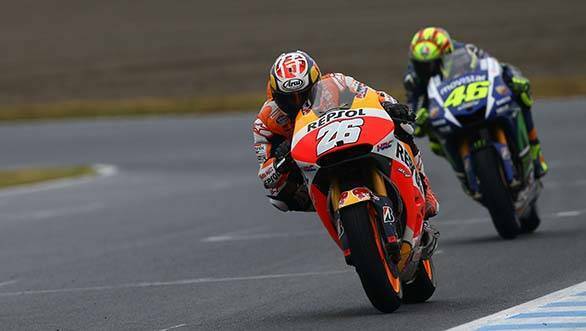 It was a surprise win for Dani Pedrosa at the Twin Ring Motegi. In a race that saw Yamaha rider Jorge Lorenzo on pole, with Rossi second on the grid, it was almost a given that it would be one of the Yamahas on the top step of the podium. Of course, that was when we hadn't taken into account the resurgent Dani, complete with recovered limbs after surgery for arm pump. We saw him battle fiercely at Aragon, and at Motegi we witnessed it again. Pedrosa surged through and eventually turned the lead into a win. His first of 2015, and his 50th MotoGP win. It wasn't going to be Lorenzo's day later either, with the Spaniard and his team-mate battling grip issues with the Yamaha M1. Rossi raced a little more conservatively during the early stages, however, preserving his tyres. Once Pedrosa got past Lorenzo, there wasn't much stopping Rossi from doing the same. It happened on lap 20. Rossi closed in, and then attacked, causing Lorenzo to nearly run off track. Rossi was through which meant the canny Italian extended his lead over Lorenzo by 18 points. Finishing fourth was Marc Marquez, who'd spent most of his race in fifth, managing to get past Andrea Dovizioso's Ducati towards the closing stages of the race. Cal Crutchlow took sixth place away from Bradley Smith on the last lap. While wildcard rider Katsuyuki Nagasuga took a fine eighth place on the yellow, black and white liveried factory M1. Hector Barbera finished ninth, with Scott Redding tenth. MotoGP now heads to Phillip Island, with the Malaysian round next, followed by the season finale at Valencia.